← Flycorvair.net passes 200,000 page reads. 5-4-13. Our local area of north east Florida saw torrential rain on Thursday and Friday. St Augustine recorded 12 inches in one day, and we had 8″ in 8 hours on Thursday night. Below are some of the pictures of flooding at our airpark. Above, Rain does not stop the mailing of parts. I leave for the first leg of getting to the post office at noon Friday. This is knee-deep swamp water in our yard. I walked out through 300 yards of this to get to the high ground where we parked the truck. 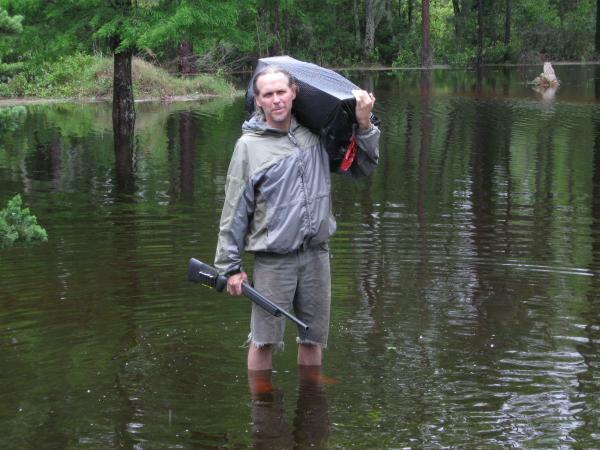 The 20 gauge is due to the Water Moccasins and Diamond Backs that were dislodged by flooding. Our area has a very high density of both, and they are excellent swimmers. I have lived in both rural areas and urban ones, and have found that rural living requires infrequent times of high vigilance, like walking through swamp water, but urban living requires a different kind of daily vigilance I find much more tiring and stressful. Above, Grace takes ScoobE out on the only part of our yard that was not submerged, the top of the septic tank. 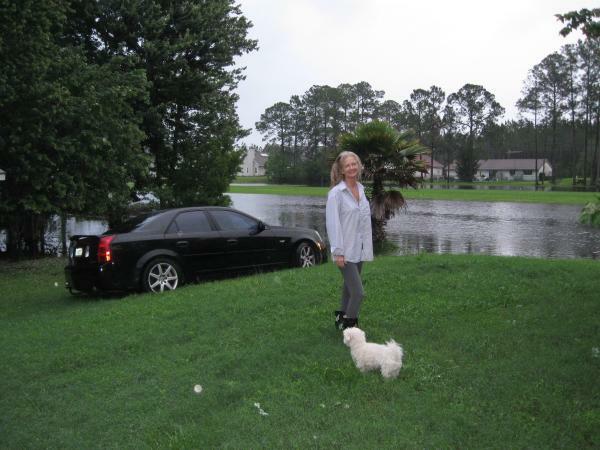 When the water was rising quickly, We moved her Caddy up there also. Our house always stays dry because it is 5′ above the yard. The green strip of land behind Grace is the crowned top of the runway. No need to run the sprinklers this week.